A lot of sheep and cattle are raised in Turkey. They take priority when the shepherd needs them to cross the road. Traffic just has to wait. 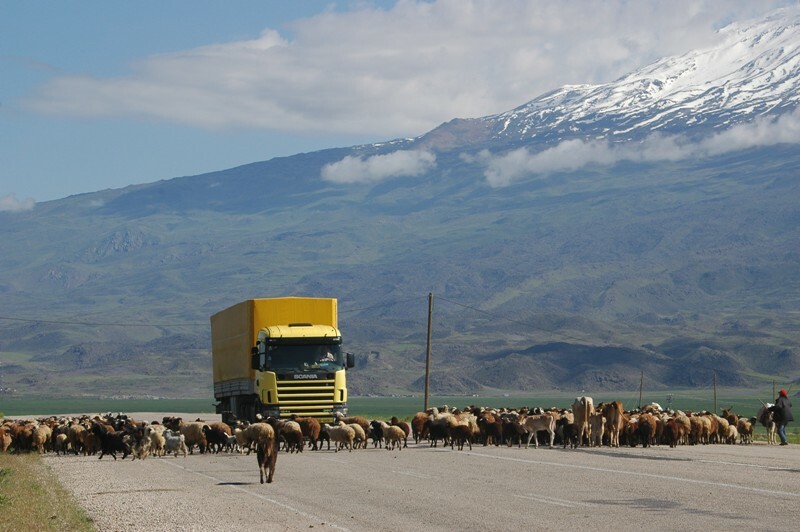 Ararat Traffic Jam. Photo by Leon Mauldin. You can see Mt. Ararat in background. I love moments like this. This entry was posted on Friday, August 10th, 2012 at 10:24 PM and is filed under Bible History and Geography, Bible Study, Old Testament, photography, Sheep, Travel, Turkey. You can follow any responses to this entry through the RSS 2.0 feed. You can leave a response, or trackback from your own site. If not for truck and telephone pole it could be 2,000 years ago. Great love all your pictures. Use some in sermons. And that mountain in the background is where Noah’s ark rested! (Genesis 8 : 4) Beautiful!